THE villages along the road between Malton and Helmsley have more than ordinary interest to the historian. They are built along the route of a Roman road which extended as far as the Roman stronghold of Aldborough. The interest of these villages begins as soon as Malton is left behind. At Broughton, the first village encountered, numerous barrows or tumuli have been discovered at various times, and the finding of Roman urns here some years ago suggests that there may have been a Roman camp in the immediate vicinity. Slingsby boasts a castle, the only one remaining of the three built there. Made of oolitic limestone its ruin is a commanding feature of the village. But it is to Hovingham we must go to find even more ancient remains than at Broughton or Slingsby. Hovingham is one of the prettiest villages in the district adjacent to the Howardian Hills, lying among thick woods and coppices. There is evidence that Hovingham was originally a Brigantian settlement and subsequently a Roman camp. During excavations made adjacent to the present hall in 1745, some very interesting Roman remains were discovered. A bath, measuring about 12ft by 11ft, with a roof of polished, perforated tiles, tessellated pavements, fragments of Roman pottery, and coins of the reigns of Antoninus Pius, Hlarcus Aurelius, Constantius, and Constantine the Great were found in good condition. But it was in the year 1616 that a gory secret was unveiled. There was unearthed nearby at East Ness a sarcophagus full of bones, with an inscription which recorded the deaths of Titia, the wife, and Valerius Adjutor and their sons who were thought to have lived in a nearby Roman villa. So without anymore ado let us take a walk on the hills overlooking these interesting villages starting from Slingsby and passing through Hovingham to enjoy the architecture and perhaps have a snack at one of the local hostelries there before returning to Slingsby by the ridge route where more refreshment awaits. Walk along Slingsby’s main street, passing the Grapes Inn on your left. Just before the de-restriction signs, turn left over a bridge onto a wide public footpath. You are now on the track of the North Eastern Railway Thirsk to Malton branch line. It opened in the 1850s and was closed in 1964. To commemorate the line, the residents of Fryton constructed the Fryton Millennium Heritage Trail. You will find details and a plaque further along the track. After passing the plaque you arrive at a road. Go left, then immediately right here to rejoin the track across a field. Keep straight ahead following waymarks to a copse of trees across the field. Go through the copse, then left and right. Across the field go left, then shortly right over a bridge, then straight on to eventually pass through a hole in the hedge. Keep straight on to a path between the pub car park and the tennis court to enter Hovingham village. On your right is the Malt Shovel pub and a little further along on your left is the café. Turning left on entering the village takes you to the Worsley Arms and a tea shop almost opposite. Walk along past the Worsley Arms on the B1257 which runs through Hovingham. In a few paces the road takes a severe left turn. Leave the road here to go straight ahead onto a footpath at the right of a stone trough with the B1257 Malton sign on it. Soon join a road and keep walking uphill. Cross the road onto the wide grass verge. 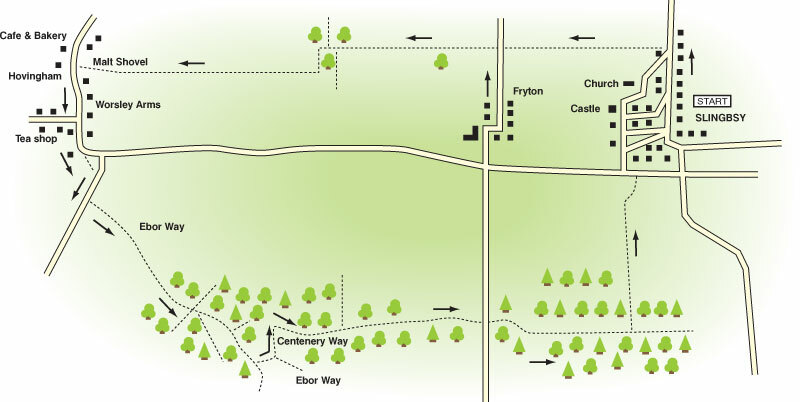 Before you reach the top of the hill, go left onto a wide track signed as Ebor Way and Public Bridleway. Uphill now to soon reach the top, continue on with grand views across Ryedale until you reach a wood. Enter the wood bearing left and walk along keeping straight on at the crossroad of tracks. In a few paces go left at the blue waymark downhill. Keep straight ahead at all times now until you almost reach the end of the wood. As the track bends to the right, you must go left at a blue waymark keeping the wire fence on your right. Soon you reach a gate. Through the gate turn left signed Centenary Way. Walk along this grassy area. At the end bear right and across a beck, past a Centenary way sign pointing you to a gate and stile into the wood. A narrow ascending path through the wood now which takes you all the way up to a ridge. Walk along the ridge passing the occasional Centenary Way sign until you eventually reach a barrier gate and a road. Walk straight across the road to continue the ridge walk. Enjoy the woodland walk and eventually leave the trees. Walk past one and a half fields, then go through a small gate on the left and onto a path across the field. Enjoy grand views across the valley to the moors in front of you. Once across the field go left and in 20 yards go right downhill along a lane to the road. Straight ahead now, cross the main road with care to return to Slingsby. Distance – 7½ miles (12km). Start/Grid Ref – Slingsby, grid ref. 699749. Best map – OS Explorer 300, Howardian Hills & Malton. Parking – Respectfully in village main street. Refreshments – Pub and café in Slingsby, two pubs and a café in Hovingham. Guide book – Walking around the Howardian Hills by J Brian Beadle published by Trailblazer at £2.50, available from Trailblazer Outdoors in Pickering, book shops, NYMR railway stations, visitor centres and tourist information centres.